Do Image ALT Tags Matter? Yes, they absolutely matter. Not only are they a great way of providing additional information though screen tips, they are a critical part of the web’s experience for visually impaired people. I like to review my clients’ websites in a browser called Lynx, which is a text-based browser. This browser lets me see what Google and other search bots see because it doesn’t draw all the fancy pictures and flashy features. All it shows is the text, which, for the most part, is Google’s main focus. (Yes – I know, I read algo patents so I know there are many other things Google looks at, but suffice it to say that text is the most important.) Lynx behaves somewhat like a visually impaired person’s screenreader would. It only shows the text, and instead of images, it displays image alt tags. See the screenshot below to see how Lynx displays an image alt tag. Image alt tags appear in place of the image according to where the image is referenced in the code. If you insert an image in the middle of a sentence and then align it to the right, your image alt tag will show up in the middle of your text. Do this for dozens of images on your page, and it’s possible your image alt tags could cause content quality (Panda) problems because of the random insertion of text that throws off the grammatical structure of your content. Let’s be honest, Google is really all anyone really cares about because they receive the lion’s share of search queries on the web. Since we care about them most, let’s try answering these questions: Does Google index image alt tags? 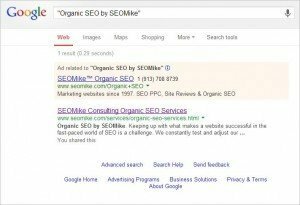 Do image alt tags influence your ranking in Google? The answer to both is the same: yes. It’s often said by SEOs who don’t test their opinions that image alt tags don’t matter to Google. They say Google doesn’t really pay attention to them and that you can’t rank a site based on what’s in the image alt tags. They say it on their blogs, they say it at conferences and it just becomes part of the landscape. Good thing I don’t pay attention to them because they’re wrong. 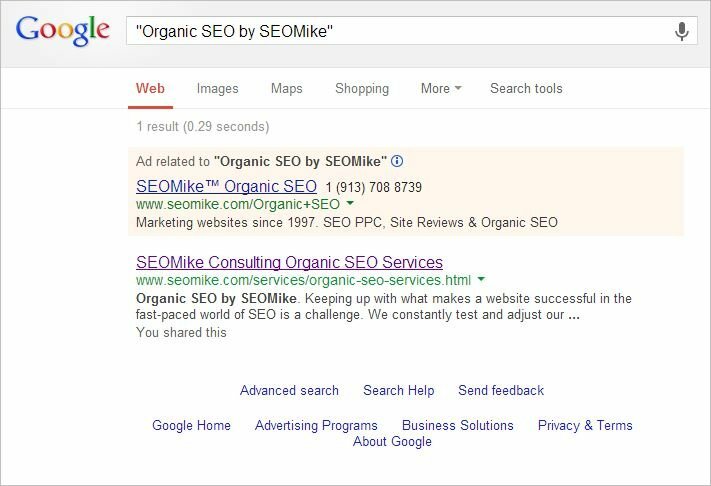 The only place on the internet, until now, that the text “Organic SEO by SEOMike” existed was in an image alt tag on my Organic SEO services page. If Google doesn’t pay attention to image alt tags, and it’s not possible to rank a site based on what’s in them, then how do you explain the screenshot below? You can’t, because Google absolutely does pay attention, and you absolutely can rank a site based on what’s in the image alt tags. Does Google pay attention to Image alt tags? Can you rank based on their content? Yes and yes. What about Bing and Yahoo? …yawn… As usual, I really don’t care because their results are so crappy and their share of search is so low. (See this blog post for why I don’t give a Bing) I figured I’d check anyway. As far as I can tell, you currently can’t rank in Bing-ahoo based on the content of image alt tags. Bing doesn’t care about Image alt tags. Yahoo doesn’t care about image alt tags either. Google isn’t the only one that cares about image alt tags. In a case brought by the National Federation of the Blind against the retailer Target, the NFB claimed “that blind people were unable to access much of the information on the defendant’s website, nor purchase anything from its website independently.” The NFB claimed that Target could have made their site accessible by “use of the alt attribute for images featured on the website. For example, when a blind user visiting this website selected an image of a Dyson vacuum cleaner using his or her tab key, the voice synthesizer on the computer would say ‘Link GP browse dot html reference zero six zero six one eight nine six three eight one eight zero seven two nine seven three five 12 million 957 thousand 121’ instead of a useful description of the image.” (Source) Because Target didn’t have proper image alt tags configured on their website, they paid a settlement to NFB in the sum of $6 million, PLUS lawyer costs of $3.7 million for a total of more than $9.7 million. The lack of image alt tags cost Target nearly $10 million. CSS background images don’t get alt tags! It is not possible at this time to associate image alt tags with CSS background images. CSS background images are supposed to be for aesthetics, not for any meaningful value. There’s no excuse not to use them. Image alt tags are so easy to implement that there’s really no reason not to use them, except for being lazy. You just learned what laziness cost Target and the value they bring to a website. Now go put them to work for you! I received an email that scoffed at my post basically saying “if image alt tags are so important, how come none of the people who rank for ‘[city] [common service]’ use them?” The answer is simple; image alt tags are one piece of the puzzle. There are over 200 different factors that Google uses to choose where to rank a website in any given set of listings. The example above proves that, contrary to the beliefs of many SEOs, Google does pay attention to the tag and it does impact your overall optimization – but it is only one influencing factor. If you think you’re going to rank for “[city] [common service]” based solely on the keywords in an image alt tag, please continue to read my blog because there is a lot more to SEO than you think.